Religious freedom is widely recognized today as a basic human right, guaranteed by nearly all national constitutions. Exporting Freedom charts the rise of religious freedom as an ideal firmly enshrined in international law and shows how America’s promotion of the cause of individuals worldwide to freely practice their faith advanced its ascent as a global power. 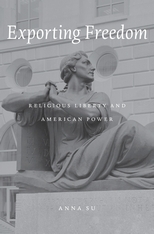 Anna Su traces America’s exportation of religious freedom in various laws and policies enacted over the course of the twentieth century, in diverse locations and under a variety of historical circumstances. Influenced by growing religious tolerance at home and inspired by a belief in the United States’ obligation to protect the persecuted beyond its borders, American officials drafted constitutions as part of military occupations—in the Philippines after the Spanish–American War, in Japan following World War II, and in Iraq after 2003. They also spearheaded efforts to reform the international legal order by pursuing Wilsonian principles in the League of Nations, drafting the United Nations Charter, and signing the Helsinki Accords during the Cold War. The fruits of these labors are evident in the religious freedom provisions in international legal instruments, regional human rights conventions, and national constitutions. In examining the evolution of religious freedom from an expression of the civilizing impulse to the democratization of states and, finally, through the promotion of human rights, Su offers a new understanding of the significance of religion in international relations. We noted this book forum on Exporting Freedom earlier. Full information on the book is available here.